Readiness is key for a military force. People and equipment need to be ready at a moment's notice for whatever mission is likely to arise, from combat to natural disasters to humanitarian missions. System failures simply can't be tolerated. Compact and portable machine condition monitoring equipment allows the military to ensure that its vehicles and machinery remain in ideal working condition. When it comes to the armed forces, hydraulic fluid, oil, and other lubricants ensure that vehicles and machinery remain in ideal working condition. However, conducting machine condition monitoring while out in the field historically has been slow and expensive, as the lubricant sample often must be transported to a laboratory for analysis before the results can be returned to the field. Conforms to ASTM D6595 - "Standard Test Method for Determination of Wear Metals and Contaminants in Used Lubricating Oils or Used Hydraulic Fluids by Rotating Disc Electrode Atomic Emission Spectrometry"
With Spectro Scientific's technology, designed for field use, our armed forces can move forward with the knowledge that their machinery remains safe and reliable with the help of efficient and cost-effective oil analysis. 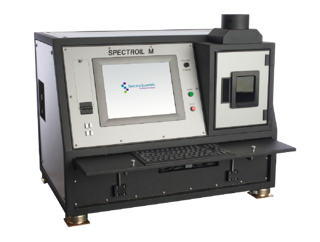 To learn more about the SpectrOil product line, please read our white paper on Optical Emission Spectroscopy.